Giants Ridge is one of Minnesota’s top golf destinations. Giants Ridge golf course include the Legend and the Quarry; both courses offer fun challenging golf wrapped in spectacular scenery. 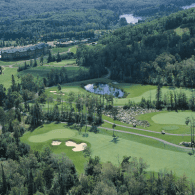 You won’t find any other Minnesota resorts with this caliber of golf courses! The Legend carved out of the Superior National Forest with spectacular views. When it first opened, it was named one of the “10 Best New Upscale Public Courses in the Nation.” Year after year, the Legend has harvested national and state rankings from Golf Digest, not only for its character and quality but also for its affordability. It’s the fourth Public Golf Course in Minnesota. With its unique holes that grow more beautiful as the years go by, the Legend continues to gain impressive rankings. Overall this course is a cherished Giants Ridge golf course. They also feature winter recreational areas like thirty-five downhill runs, snowshoe trails, and a fantastic snow tubing park! The Quarry sculpted from the Northwoods and abandoned mine lands, has a style of its own. This course is ranked as the first Public Golf Course in Minnesota by Golf Digest. Raised tees and deep hazards forged through mine lands, wetlands, forests and the former sand quarry challenges golfers to dig deeper and risk more. The Quarry offers incredible scenery and is an excellent tribute to Minnesota’s mining history. Making the Quarry is one of the top Giants Ridge golf course. Not only does this beautiful area offer beautiful golf in the summer, but when the winter flurries come it doubles as a Ski and Snowboarding Area. Any Minnesotan will tell you all season areas are crucial up here in the North Shore! Join us at The lodge at Giants Ridge and enjoy golfing Giants Ridge golf course in the heart of Minnesota’s beautiful North Shore.